In December last year, it was announced that Def Leppard would be enshrined into The Rock And Roll Hall Of Fame as part of the Class Of 2019. The ceremony will take place at the Barclays Center, Brooklyn, on March 29, with Def Leppard going into the Hall with Stevie Nicks, The Cure, Radiohead, Roxy Music, The Zombies and Janet Jackson. 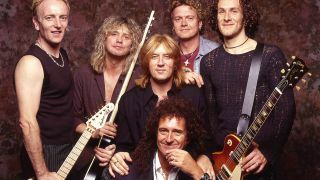 It was first time Def Leppard had been nominated for the honour – and it’s now been confirmed that Queen guitarist Brian May will personally induct the Sheffield heroes into the Hall Of Fame. The current Def Leppard lineup of Joe Elliott, Rick Allen, Vivian Campbell, Phil Collen and Rick Savage are listed, along with late guitarist Steve Clark and the band’s original guitarist Pete Willis. Def Leppard topped the annual fan vote and their inclusion means that every artist who has come top of the fan poll since it was introduced in 2013 has gone on to be inducted into the Rock Hall.